For the Packies, Cooks, Cowboys, Wranglers & the BOY! While this race is relatively shorter than the Epic option, riders should still have a reasonable standard of fitness and be comfortable crossing rivers with their bikes. Race start 9:30am start with briefing at 9:15am. 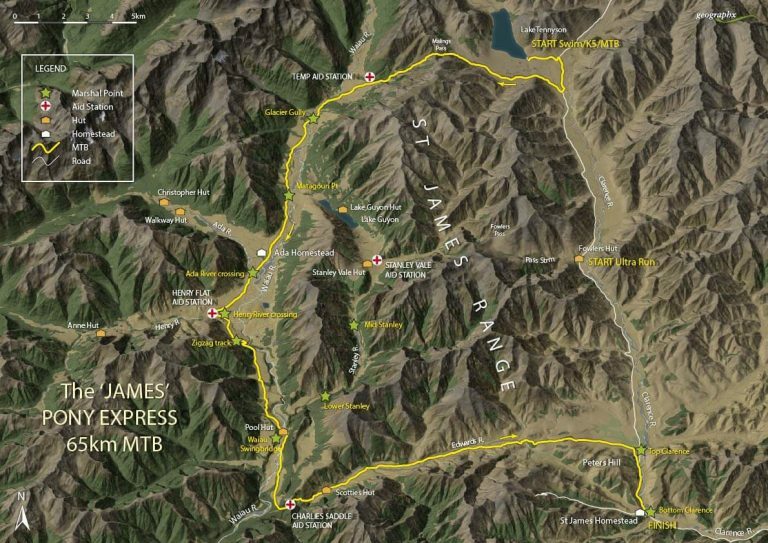 The race will start at 9:30 am (race briefing 9:15 am) from the Lake Tennyson car park area and follow the 4×4 track (think “Dual Single Track” – DST) to the top of Malings Pass, from where riders can enjoy a solid 5km downhill descent to the Waiau River. From here the DST crosses the river and continues for a couple of km down the Waiau valley toward the historic Ada homestead. Joining the DST, riders will climb up the Waiau terraces and up over Charlie’s saddle to follow the 4×4 track up the Edwards valley (crossing the river 3 times) where (at around the 60km mark) they will have one last short-sharp climb up out of Bull Gully before decending down to the Edwards gate at the Clarence where they will follow the road back to the finish at the St James homestead.